Bangladesh Under 15 National Football Team booters are all-set to face their challenge in the upcoming UEFA U-15 Football Tournament 2018 which is scheduled to kick-off at Thailand on December 10. A press-conference regarding Bangladesh’s overall preparation for the tournament was held at BFF House conference room in the capital on Wednesday. Bangladesh U-15 National Team Manager Amit Khan Shuvra, Delegation Deputy Head Mohidur Rahman Miraj, Head Coach Mostofa Anowar Parvez and Captain Mohammad Mahedi Hasan were present in the press-conference. BFF General Secretary Abu Nayeem Shohag was also present in the event. 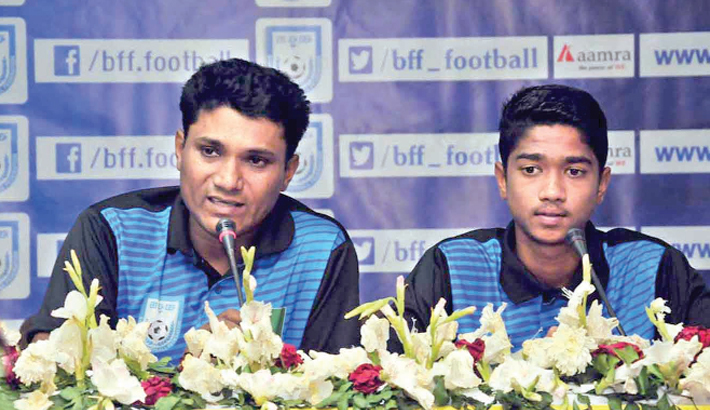 During the conference, Coach Mostofa Anowar Parvez and Captain Mohammad Mahedi Hasan stated that even though Cyprus and Thailand are a new team to face Bangladesh, the national team will give their best efforts to do well against them. They further expressed their teams confidence in winning over Maldives in their third match of the tournament scheduled to take place on December 14. Bangladesh will face Cyprus on December 10 and Thailand on December 12.